Just North of Toronto, outside the city of Owen Sound, a gorgeous country club and golf course is stationed directly along the shores of Georgian Bay. 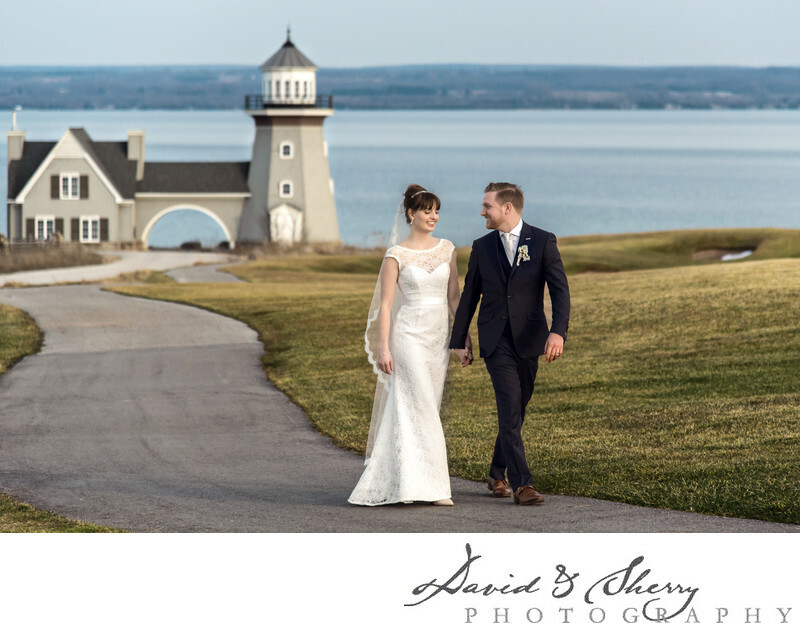 Cobble Beach is a high-end and elegant wedding venue that provides a romantic atmosphere and flawless backdrops for photography.The sight of the water from this location is spectacular, giving a panoramic view of the bay as well as small islands and escarpments in the distance. The location is just a short drive from Owen Sound’s harbour; therefore there are often boats coasting along the lake during the warm summer months. This waterfront resort has many areas in which photographers can use to shoot. One of my favourite places on the grounds is the lighthouse, located on the edge of the golf course along the shore. Complete with tasteful shutters and white trim, this building is a great setting for formal bridal party shots, as well as coverage of the bride and groom. I love the romance captured in this shot as the newlyweds stroll hand in hand along the path from the lighthouse. The chemistry and love between the couple, as well as the cool blue lakeshore in the background, make this image appear as though it was taken straight out of a movie scene. Location: 221 McLeese Drive, Kemble, ON N0H 1S0.